All transactions are safe and secure with a reliable history in online purchasing behind each of our associates. 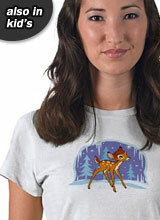 Buy the Bambi Snow Scene t-shirt to own Bambi clothing and merchandise. Winter is a wonderful time of year and even better for those who are getting their first taste of it. For Bambi it was a chance to see his footprints in the snow, go sliding around on the lake with his buddy Thumper, and check in on Flower while she hibernates. If you understand why he enjoys the snow and cold weather, then this Bambi tee will be a perfect match for you. If you want to wear it around in the snow, then I would suggest getting it on a sweatshirt, long sleeved shirt or hoodie instead. All of these are available for men, women and children with this lovely winter theme design. Let it snow! In addition to the Bambi Snow Scene tee above, browse the Bambi Clothing Gallery for more apparel like men's and women's clothes, kids shirts or hoodies.